The Arduino system offers an easy and open-source method for programming microcontrollers. Normally this means using a serial cable or USB cable attached directly to the microcontroller project. But what if your project is floating in a weather balloon, glued to the bottom of a swimming pool or baked into a loaf of bread? It would be great to upload code changes wirelessly, and even greater if you could do it from several kilometers away. 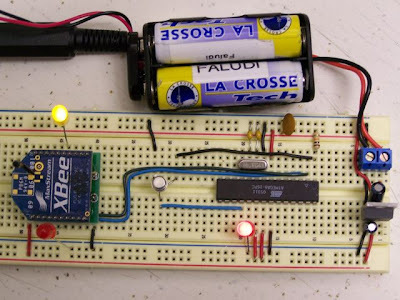 The following example demonstrates how to build a complete wireless solution for uploading code to a remote Arduino microcontroller using a couple of XBee radios, and a handy function for accomplishing wireless resets.